QALQILYA, West Bank — Residents in this Palestinian city never see the sunset; Israel’s imposing security wall blocks the view towards the west, and much else. 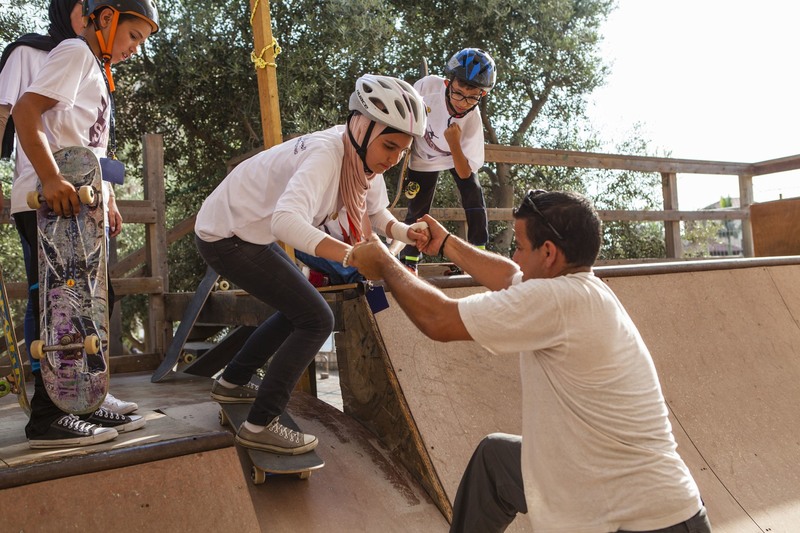 Now, a skateboarding summer camp in Qalqilya is helping kids to see a new horizon. “When you get on the skateboard, you don’t think about all the problems you have. All you’re focused on is that you have to stay on the board and not fall,” said Abdullah Milhem, a 17-year-old from Qalqilya who first picked up a skateboard five years ago. He says his hobby has changed his life and gave him a positive outlet for his energy instead of hanging out on the streets or getting involved in drugs or violence. That’s exactly the kind of empowerment the organizers of the nonprofit camp, SkateQilya, are hoping to foster by using the skateboard as a tool to teach independence, creativity and leadership skills to young Palestinians in the West Bank, which was captured by Israel in the 1967 Mideast war. SkateQilya is the fruit of years of collaboration between executive director Mohammed Othman, a Palestinian community organizer and film producer, and New Yorkers Adam Abel, an artist, and Kenny Reed, a former professional skateboarder known as the “Traveler” because of his work in countries such as Afghanistan and North Korea. The three-week, non-residential program gets much of its funding from an American non-profit called “Playgrounds for Palestine.” They also use the Indiegogo website to crowdfund campaigns and say they have received donations of money and equipment from all over the world — including from the shoe company Converse and individuals in the West Bank, Israel and the U.S.
Othmand and Abel initially worked on a documentary about skateboarders and hip-hop culture in the West Bank in 2011. They built a skateboarding ramp, but when it began to fall into disrepair in 2015, they decided to do more than just rebuild it. The following year, the two launched the non-profit summer camp for Palestinian kids. The camp is focused on what organizers see as three integrated activities: Reed teaches the kids how to skateboard, Abel leads photography and videography classes and Othman does community building — teaching boys and girls to work and play together — as well as leadership training.This summer they worked with 35 children between the ages of 9 and 17. The program’s location in Qalqilya, hemmed in by Israel’s 26-foot tall concrete wall, is not lost on anyone involved. Israeli officials often refer to the barrier as an “anti-terror obstacle,” while Palestinians call it an “apartheid” wall that they say cuts them off from the world and reinforces the Israeli occupation of the West Bank. Palestinians say the wall undermines the goal of a two-state solution — a position widely backed by the international community. Othman is proud of the SkateQilya logo which imagines a skateboarder soaring off the wall, liberated from its confines. And for the camp’s leaders, the sport epitomizes freedom. And the organizers have been adamant that the camp is a place for boys and girls — some from very traditional backgrounds — to learn how to interact. The fact that girls are full participants is a particular badge of honor, according to Othman. “Everyone thinks Qalqilya is a conservative city, but last year we had 12 boys and 12 girls. This year, the summer camp, we had more girls than boys,” he said. And the girls are having a ball. “It’s an amazing experience, because it’s a new thing in Palestine. There are not too many girls skating,” said Faiza Mata’a, a 17-year-old girl from Haja, a Palestinian village in the northern West Bank. 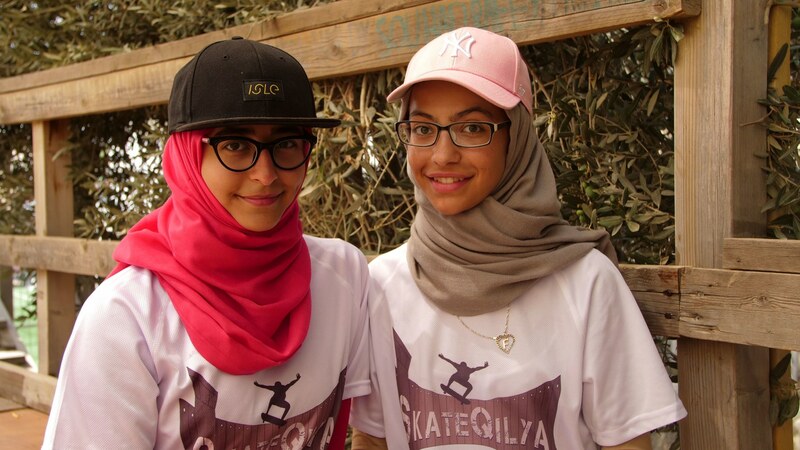 Sporting a pink Yankees baseball cap over her hijab, glasses and a T-shirt with the SkateQilya logo, she explained that her parents not only told her it was okay to go skateboarding, but encouraged her to do so. Her friend and co-camper Shahed Helal, 16, is also from Qalqilya but now lives in Saudi Arabia. In fact, she believes she is the first female skateboarder in the kingdom, all with her parents blessing. To Abel, giving the kids that chance to play is vital to their development. For Milhem, who speaks fluent English with an American accent he picked up watching movies, skateboarding is about connecting with people. “Whatever religion or race you come from — if you’re a skater and I’m a skater — we’re just instantly friends. That’s how skateboarding is,” said Milhem, who worked as an assistant skate instructor with the camp this summer. But skateboarding has also taught this young man, who dreams of escaping the confines of Qalqilya, about resilience. Lawahez Jabari reported from the West Bank. Petra Cahill reported from London.